TSPSC Group 4 Answer Keys 2018 OMR sheets Download Solutions & Question Papers for SET A B C D TSPSC Group 4 Exam 2018 Paper-I,Paper-II OMR Answersheet Download TSPSC Group IV Answer Key Paper I and Paper II Exam Preliminary, Final key download for Group 4 Services posts including 72 junior assistant posts in the RTC, 124 bill collector posts in Greater Hyderabad Municipal Corporation (GHMC) and 76 posts in Beverages Corporation. Typist, Jr Asst, Steno Telangana Group IV Recruitment Exam conducted on 7th October 2018. Telangana State Public Service Commission to fill up various Vacancies in GHMC TSRTC and many other departments of Telangana. Candidates with suitable Educational qualifications have submitted Online Applications through TSPSC web link. Download Hall Tickets from One week before to the exam. Group IV Recruitment Exam successfully conducted on 07.10.2018 . Now the aspirants who attended for these exams are awaiting foe answer Keys. The candidate can download TSPSC Group4 Examination Paper I and Paper II Answer Key 2018 for Set A, B, C D for all papers from link given on this page . Common Examination for Recruitment to the posts of Group IV, JA in RTC, Bill Collector in GHMC and Various posts in Beverages Corporation Group IV Services (Notfn No.10/2018), Junior Assistants in TSRTC (Notfn No.11/2018), Bill Collector in GHMC (Notfn No.17/2018), and Various posts in Telanagana State Beverages corporation Limited(Notfn No.18/2018) The candidates, who have applied for the above Notifications that downloaded their Hall Tickets from Commission’s Official Website www.tspsc.gov.in. And appeared the examination for Group 4 posts on Sunday i,e., October 7, 2018. The Paper-II exam held from 10:00 am to 12.30 pm while Paper-I exam conducted from 2.30 pm to 5.00 pm on Sunday. The paper mainly covered two subjects - General Knowledge and Secretarial Abilities which will contain 300 marks. The test time is 150 minutes per paper. The language of the question paper will be English, Telugu and Urdu. The Candidates will be considered for the posts for which he/she has filled separate individual applications but the examination is common. TSPSC Group 4 Answer Key 2018 Download Paper-I,Paper-II Solutions, Question Papers for SET A B C D final Keys from here. Aspirants competed for the TSPSC Group 4 Prelims examination can download the answer key from the TSPSC website, tspsc.gov.in and compare with the corresponding set (Set A, Set B, Set C, Set D), estimate the score by comparing with the given answers. By doing so aspirants can get to know their score approximately. With this, the competitors can understand whether they can qualify the exam or not. Also, by assessing the competition, candidates can know about their stature in the competition. .
TSPSC has conducted written Examination for the above notifications on 07/10/2018. The Final Keys of this exam will be available on TSPSC website from 04/12/2018. For further details please visit www.tspsc.gov.in. No further objections will be entertained on Final keys. # WEB NOTE - PRELIMINARY KEYS FOR GROUP-IV AND OTHER THREE NOTIFICATIONS (NOTFN.NOs.10/2018, 11/2018, 17/2018 and 18/2018). # TSPSC Group IV 2018 Official Answer Key. Step 5: Take a copy of printout. TSPSC VRO 2018 Official Preliminary/ Final Key here. # TSPSC Group IV 2018 Final Answer Key. 1- GHMC Bill Collectors Recruitment 2018 Cut Off Marks. 3-TS Beverages Corporation Exam Answer key 2018 for AAO, ASO,DPA,Steno Posts Cut Off Marks. # TSPSC Group IV 2018 Cut Off Marks. 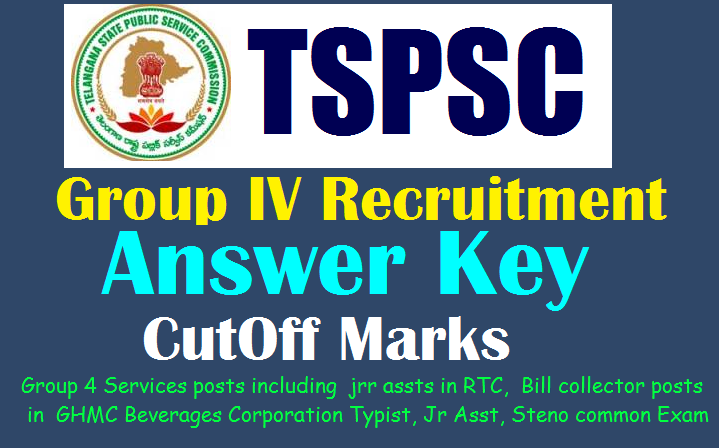 Tags: tspsc bill collectors answer key , group 4 key, tsrtc,tsbc recruitment exam key, tspsc bill collectors key, group 4 key,tsrtc key ,tsbc answer key,tspsc bill collectors key,group 4,tsrtc,tsbc results TSPSC Group IV Exam Answer Key 2018 Initial / preliminary, Final Keys , Cutoff marks Eenaduptatibha, Sakshieducation, manabadi keys with Question paper download.